The challenge: To run a quick test in production that would give visitors the ability to live-chat with customer service when they had questions about the plans on the signup page. This request came from marketing, to see if we could help answer immediate questions customers had about the plans. My role & approach: I worked with the Director of Marketing to understand the bottlenecks and their needs. I also worked with our copywriters to play with the tone of the messaging. Then I created variations of the messaging and placement to be able to test with users. I was able to do quick tests to figure out which was the best option to take to production and then do live testing. The impact: While we ran the test in production, we were able to find out that visitors did not have enough information to make a decision on purchasing a plan when landing on this page immediately. This was significant because we were heading into a redesign of our marketing website and this was an important issue that may have been otherwise overlooked. 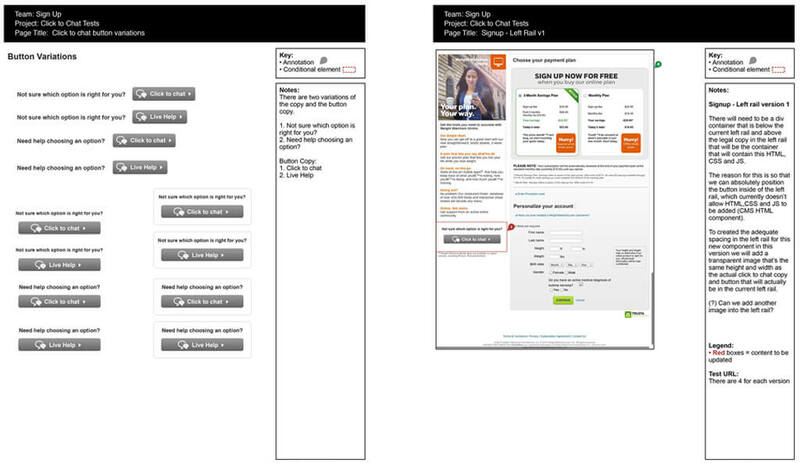 Image Caption: Wireframe documenation for click to chat. Image Caption: Webpage for click to chat.